There is something magical in all those precious stones themed online slots like Reel Gems from Microgaming. Maybe because when you look on the reels you hope you can win enough cash so you can afford a life of luxury for yourself. Anyhow, even if you do not win life changing sums, at least for a while you can dream and forget about all your troubles while playing this slot. After all you have to love those big and sparkly gems. 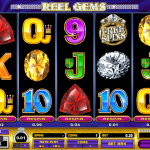 Reel Gems has all the usual special features that we would expect from Microgaming`s slots. We have a wild which appears on the second and the third reel and substitutes for any other symbol to complete a win. A diamond ring symbol is the key to the free spins. 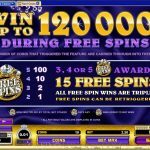 You will win 15 free spins if you land at least 3 scatter symbols. Great addition to this feature is that all the wins are tripled and if you land more scatter symbols you can retrigger the free spins. Another thing that is worth mentioning is the Respin feature where you have a chance to spin a given reel if you think you can complete a winning combination. But be careful this comes with a certain cost. 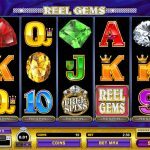 Reel Gems is a very simple game with a twist. Judging by the simple graphics we didn`t expect to see anything new here. And this is how Microgaming always manages to surprise us in a good manner. They have added the Respin feature and made the game even more appealing. Reel Gems is yet another proof that we cannot judge a book by its cover. If you’re a true Halloween fan then you should consider playing Lucky Witch a 5 reel slot by MicroGaming.